By this app you can understand and look at the vocal tract movements and their audio effects. You can modify the resonance cavities (and formants) that are in relation with our timbre perception. The source of a vocal sound is a periodic complex signal, full of harmonic frequencies that will be filtered by the vocal tract cavities. So the intensity of some frequencies can be increased, some of these frequencies will resonate more than others. rounding lips on any vocal sound. So you increase the vocal tract lenght, with lowering of all the resonant frequencies. 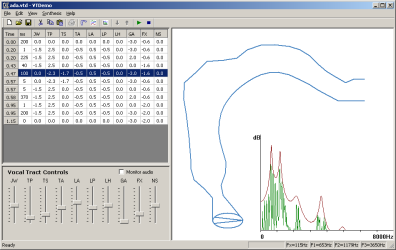 moving down the larynx, with the same acoustic result. moving the tip of the tongue forward (overtone singing), because decreasing the space of the cavity near teeth you develop F2, the second formant, developing higher harmonics. playing and trying with VTDemo, or looking at the formant variations on a power spectrum. You can modify the parameters of VTDemo (thanks to Shinji Maeda, Johan Liljencrantz and Gunnar Fant) in real time or setting a sequence of actions. Here the link, I suggest to you to try the 3.5 version, but look at my video below.